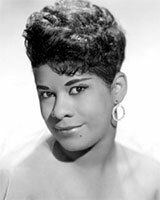 Born Ruth Weston, Ruth Brown received early music instruction from her father, a singer and choir director at Portsmouth’s Emmanuel AME Church, where Ruth sang in the junior choir. Brown’s professional career began in 1948. The following year, she was signed by Atlantic records and moved to New York, where she recorded more than 80 songs over the next 12 years. Many of those songs went to the top of the charts. Called the first rhythm and blues artist, Brown’s distinctive singing style earned her the nicknames of "Girl with a Tear in her Voice," and "Miss Rhythm & Blues." After taking time off in the 1960s to raise her family, Brown returned to the public eye in the mid-1970s, making records and exploring other performing media, including theater, television and film. She received a Tony Award for Best Actress for her role in Broadway’s Black and Blue; a Lifetime Achievement Award from the Blues Foundation; and a Grammy for her album Blues on Broadway. Her role as Motormouth Maybell in the 1988 film Hairspray was memorable. She was inducted into The Rock and Roll Hall of Fame in 1993. Brown was instrumental in the establishment of The Rhythm and Blues Foundation, a nonprofit organization based in Washington DC, which promotes the recognition, financial support, and improved royalty rates of rhythm and blues musicians. She was among the early recipients of that organization’s Pioneer Award, established in 1989.